Saltwater tank - water topoff. You would think that mixing salt and water together would be easy. Well, it is. But if you are mixing up saltwater for your marine aquarium, there are a few things that you need to do right or you can do some serious damage to your aquarium critters and even your biological filter. You can not use common table salt! Use a good sea salt mix. What to Look For and Compare When Choosing a Mix to Buy will help you choose the best sea salt mix for your aquarium. If you are starting a new (unoccupied) tank, you can fill the tank with either R/O, filtered tap water or unfiltered tap water. Do this before you add any live sand or live rock. If you put the live sand or live rock into the tank while it contains chlorine or chloramine, it will kill any beneficial bacteria or desired organisms in a matter of seconds. Once the water in the tank has been dechlorinated, you can safely add your live sand and live rock to the tank. If you are adding water to your tank for a water change, you can use a large clean container (5-gallon plastic bucket or larger container like a garbage can) to mix the sea salts. Add a water conditioner which contains a de-chlorinator (one which removes both chlorine and chloramine) to the water and circulate the water for a minute or two to distribute the water conditioner. We highly recommend that you use a water conditioner that also removes the ammonia that remains after chloramine is deconstructed. Add the sea salt mix to the water (start off with less than you think you will need. It is easier to add salt than it is to take water out, then add more freshwater)). The sea salts will dissolve faster if the water is agitated. You can stir the water with your hand (for a small container) or with a powerhead (a lot easier and faster). Mix the water until it is clear. Test the salinity (SG or Specific Gravity) of the water with a hydrometer or refractometer. The salinity of the water should be the same as in your tank if you are replacing water in your tank. 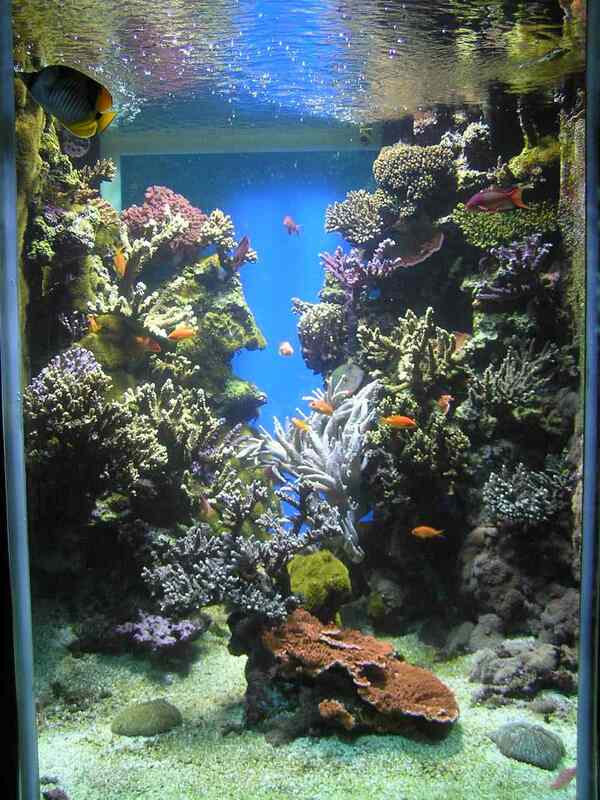 For reef tanks with corals, the salinity should be between and 1.023 and 1.025. A fish only tank should be between 1.019 and 1.023. Keep adding the sea salt mix and stirring or agitating the water until the SG is where you want it and the water is clear. If you are adding water to a running tank, the temperatures should be within a degree or two. Dropping an aquarium heater into the water container will help adjust the temperature to where you want it. Add the new water to your tank. If you are adding the new water into a tank that is already set up, putting something on your substrate (a clean dinner plate works well) will help keep your substrate in place. Rinse your container, powerhead and hydrometer or refractometer with fresh water for storage. If you are adding sand (live or otherwise) to your tank setup, the water will be very cloudy. Once you have sufficient water in the tank to run your mechanical filter, keep the filter running and either changing or rinsing the filter until the water is clear. You might want to periodically stir the substrate to keep the fine particles in suspension so they can be filtered out. Most bags of live sand contain a small envelope of a water clarifier which, when added to the water after the live sand is placed in the tank will clump the fine particles together, making them easier for your filter to trap. Add this to the water after adding the live sand.